Still haven’t tackled the stitching room, but I have been up there and it is still there. And much to my amazement the stitch and thread fairies have not appeared to put it all back in place for me…and to think I thought I had been such a good stitcher and the fairies would come and work their magic for me. I may not be the most organized stitchers but I am the one of the best at stash acquiring…”something new let me try too” is my mantra. 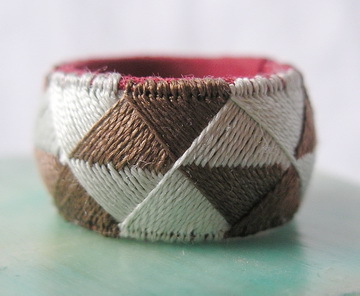 So, a couple weeks ago when Chloe Patricia of Me Mercerie blog http://mamercerie.blogspot.com/ announced she had put together thimble ring kits on Etsy http://www.etsy.com/view_listing.php?listing_id=41809157&ref=em , I was there. I bought a kit and waited for it to arrive. Now sometimes these projects end up in the stitching room, to do when I get “a round tuit”…and in many cases just haven’t found “a round tuit” I like yet. But the thimble kit arrived Saturday afternoon and I was intrigued. It was a great little kit, instructions were clear and pictures were sharp and the thimble base was put together and even had the first two rows stitched…the best two rows stitched on mine I might add. I was also surprised at the thread size I guess I was thinking #12 perle cotton and it appears to be buttonhole silk twist…ummm this project could take longer than I anticipated. But I kept it by my stitching nest and picked it up and stitched several rows at a time, even ended and began a new thread. I did decide quickly I needed another needle and chose a #10 Milliners needle, but I think you could use a quilting needle or a sharp too. About half way through the stitching decided I could probably see better if I used my magnifier, I was right but I am not frog stitching. But every time I picked up the thimble to stitch I had to remind myself no one was going to judge my first attempt and it was a learning process. My stitches aren’t perfect, heck some aren’t even even but I persevered. Stitched on it Saturday and Sunday and finished it Monday morning. It was a great project and I probably will try and make a thimble from scratch next. So if you want a fun project for the week end you might visit some of the web sites and try making your own or just contact Chloe Patricia to get started. Thanks Chloe Patricia for introducing me to these. Okay off to clean…no not the stitching room…going to give the fairies a bit more time, they be out helping all of my other stitching friends. And then I am going to stitch…to paraphrase an old adage…”Stitches every day keep the doctors away.” and an apple as a snack helps too.